Have you ever looked at the skin on your face? I mean, really looked at it? What may look perfectly pleasant from a distance, is actually a jungle of oil, hairs, skin flakes and pores. And as you get older, you can expect to start seeing some wrinkles as well. Yikes! Next to unwanted facial hair and unsightly acne, large pores are one of the most problematic issues we may experience with our complexion. Here at the Alternative Daily, we like to help keep you looking beautiful and feeling confident naturally. Let’s investigate the truth behind some of the purported options for shrinking unsightly pores. Let’s start with the bad news: you can’t actually shrink your pores. They are a structural component of skin which can’t be changed or removed, and their size is largely genetically determined. Now here’s the good news: You can, however, support the skin to keep pores from getting larger over time. You can also keep skin healthy and pores clear so that they are much less noticeable. While some may opt for pore-shrinking laser treatments, or silicon-based makeup which literally fills in the pores to give the skin a smoother appearance, I prefer to leave my skin untreated and uncovered. That leaves me looking for natural approaches to improving the look of my skin. 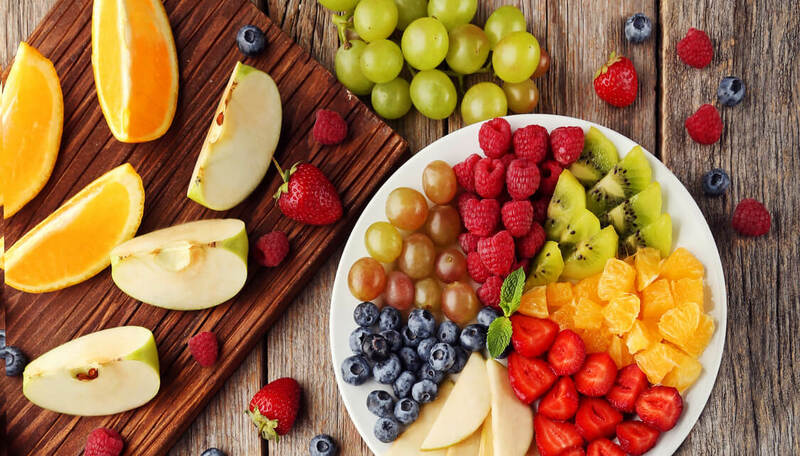 Smooth your body from the inside-out with fruits and veggies. Personally, I always start with nutrition. To me, it makes sense that beauty starts from the inside out. It doesn’t have to be complicated — simply consume lots of fresh, real foods, like fruits and vegetables, and whatever protein source is most agreeable for you. Add some healthy fats and oils, and traditional superfoods such as broth and fermented or cultured foods, and you’re good to go. You can bolster the pore-reducing power of your diet by supplementing with zinc and magnesium, which restore skin’s oil balance helping to clear pores so they look smaller. 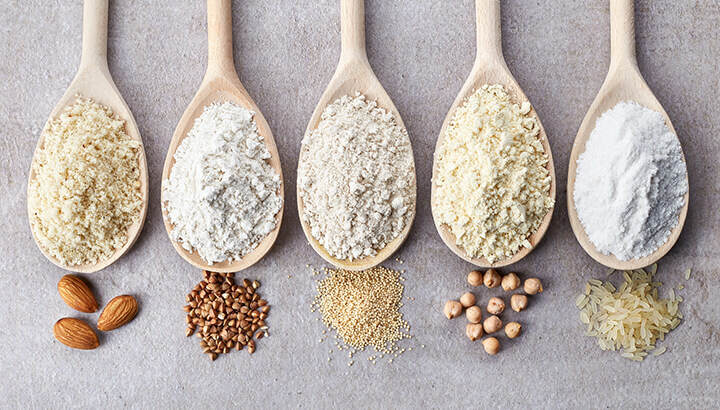 If you have food allergies, like gluten, find suitable alternatives. Also, be sure to avoid allergenic foods that bother your stomach or cause an immune reaction. I find that if I make an exception in my clean eating and consume even a little bit of gluten, I pay for it for days or weeks to follow. My skin looks dull and breaks out into pimples, I get dark circles under my eyes and my pores look terrible. 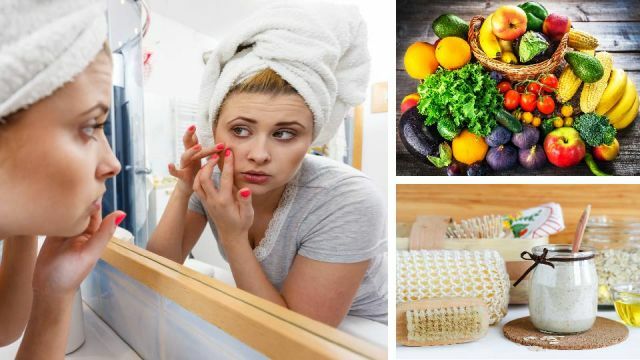 Start listening to your body to determine whether there is a food, or possibly many foods, that may be at the root of your unwanted complexion struggles. Next on the list: sleep. I’m sure you’ve noticed that after a long flight, or during a stressful week at work, or maybe after a weekend of a few too many late nights and glasses of wine, your skin tone and texture really suffers. Try to stick to a healthy sleep routine and you’ll notice your complexion glows, and your body is better able to repair and detox the skin so that your pores look their youthful best. 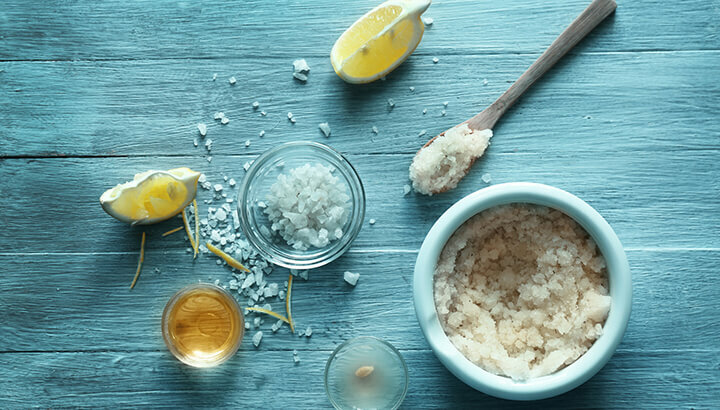 Make a simple face scrub with sugar or salt as a base. This is another important routine that can help keep pores clear and skin bright. Try making a gentle scrub with a spoonful of sugar, a little olive oil and some lavender essential oil. Another option is a little baking soda mixed into some honey. Scrub gently, then rinse with warm water and pat dry. I also love to exfoliate using a soft brush made with natural bristles. This is similar to ayurvedic dry-brushing, which is done on the body. For your face you need a smaller and softer brush. Simply use some warm water and scrub gently in small circles, working up the neck and over the whole face. Afterward, apply a little oil of your choice to moisturize. You might be wondering whether there are any natural things to apply to your skin to minimize pores. Rosewater can help to tighten skin, while aloe vera is soothing, healing and anti-aging. Pores can often appear larger and more noticeable when they are clogged with dirt, oil or residues. Using a natural clay mask to cleanse skin will do wonders to keep those pores clear and thus looking as small as possible. Try this recipe: mix a teaspoon of bentonite clay with raw honey to form a thick paste. Add a little warm water to thin the paste enough so you can begin applying to your skin. Leave on for ten minutes, then rinse well with warm water and moisturize. Massage oil onto your face to remove oil and dirt. The same idea applies for oil cleansing. Since “like dissolves like,” using a light oil such as sweet almond oil or apricot oil to cleanse the face is the perfect way to moisturize skin while cleaning out pores. If you haven’t heard of oil cleansing, it’s pretty simple. Just massage the oil of your choice onto your face and leave for a few minutes. Then wet a washcloth with hot water, wring it out and apply it to your face until it cools. The steam opens the pores and allows the oil to really clean them out. Wipe your face clean with the cloth, then rinse with cool water to close the pores. If you have blackheads, using clay masks or oil cleansing is a good way to clear out those pores, rather than squeezing the blackheads, which may cause damage to the skin and scarring, neither of which will improve the appearance of your complexion. Finally, ensure you make an effort to protect your skin from the sun, as UV damage can thin the skin and reduce elasticity over time, leaving pores looking more noticeable. Try natural sunscreens made with zinc oxide — modern formulations won’t leave you with a white nose. Or simply wear a hat and stay out of the midday sun when UV rays are at their strongest. With a little effort, you can keep your pores clear and skin youthful so you have the best complexion possible. Treat your skin well, and don’t forget, the most important beauty accessory is a smile! Hey Buddy!, I found this information for you: "9 All-Natural Cures For Unsightly Large Pores". Here is the website link: https://www.thealternativedaily.com/9-natural-cures-for-unsightly-large-pores/. Thank you.